A very contemporary Nantucket Basket Purse Handbag with a nod to New England basketry design, featuring an ash wood base, hardwood staves, leather purse details, leather and brass front snap closure and a cherry wood basket lid. The brown ash staves used to stave this Nantucket Basket Purse have each been hand-tapered and beveled. Fine Nantucket-grade cane weaving is used to weave the body of this basket purse handbag. The Nantucket Basket rims are steam bent cherry wood, scarfed and tapered, then pre-drilled and nailed with thin brass escutcheon pins. Excellent craftsmanship and attention to detail with the additional piece of cane used under the outside rim to give a more finished and refined appearance. The closure tab of brown leather is stitched along the edge to ensure longevity and strength, and has been nailed into the routed recess in the cherry wood lid for a smooth finish to the inside. The back brown leather hinges are also stitched and were also nailed into the routed groove, and nailed again through the cherry wood rims. The leather is top quality purse leather. The swing basket handle is steam bent and tastefully carved cherry wood and is attached to the Nantucket Basket Purse with Bone or Ivory knobs and washers, and a brass handle pin assembly. 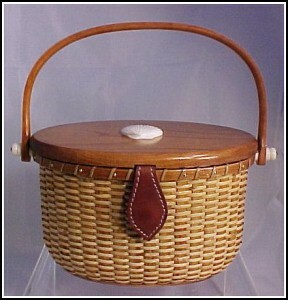 The top of this Nantucket Basket Purse is solid cherry hardwood. The entire basket purse will be given multiple coats of varnish to protect, strengthen and bring out the beauty of the natural materials. And for a decorative touch, bone or ivory hand carved 1-1/2" Nantucket scallop shell or bone or ivory whale will be attached to the top of the basket purse. All of my Nantucket Basket Purse carvings are attached with brass pins and glue to ensure that the carving will not accidentally be knocked off and lost. An optional personalized ivory quarter-board, which are traditionally attached to the inside of the Nantucket Basket lid, is available for an additional $225.00. This board can be engraved with a first name, middle initial and last name. My New England Nantucket Basket Purse is a variation of the original Cape Cod Purse design. As are all my fine Nantucket baskets, I will sign and date the base. This contemporary New England Nantucket Basket Purse measures 9-1/4" from knob to knob, 5-1/8" from front to back, 5" high to the lid and 9" high to the top of the cherry wood swing handle. Although I am no longer accepting orders for the Nantucket Basket Purse New England Style, I do craft one or two of these per year. When its ready for sale, you can purchase it directly from my Simply Baskets website.